If you want to close more deals than the competition you must understand your sales better than them. 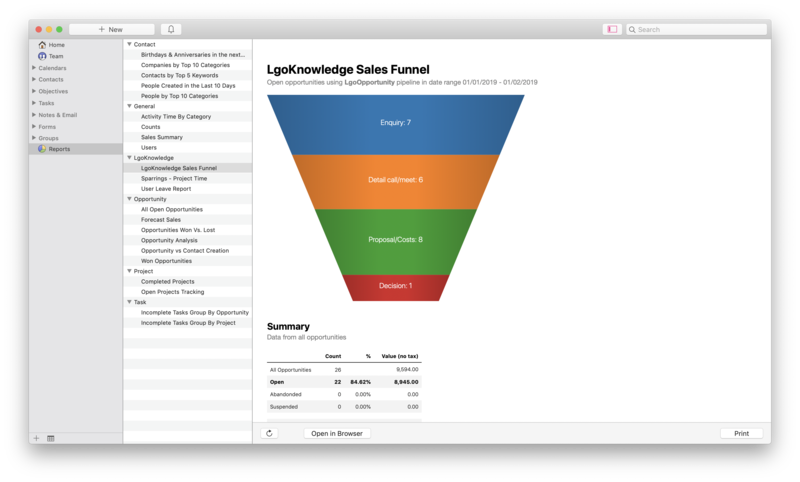 That’s exactly where Lgo Knowledge started with their latest Daylite report: Sales Funnel Report. Sales Funnel Report gives you a clear summary of your Opportunities.With Sales Funnel Report, not only can you get an overview of your sales process, but you can also understand which areas need the most improvement. Fix any bumps in your sales process by finding out at which stage deals are stuck or getting lost. Now you can target those weaker areas and make sure your process is always improving. When you use Sales Funnel Report, you can also see which deals to focus on. By showing you Opportunity values as well as the win/loss ratios for your pipelines, you can go all in on the big winners. Sales Funnel Report can have a dramatic effect on how you view your Opportunities in Daylite. Not only that, this powerful and easy-to-use report is free to download from Lgo Knowledge. Lgo Knowledge understands the issues businesses face and are passionate about technology. Focusing on training, coaching, and customized solutions, Lgo Knowledge offers services worldwide and is ready to assist you today.